The IT helpdesk at the Gloria Hotel were having to help too many staff members set up an event banner on their email signatures, taking up resources needed for other projects. Exclaimer Signature Manager Exchange Edition allowed IT to configure and distribute the banner easily through the hotel’s Exchange server. The Gloria Hotel is a luxury 4-star hotel located in Media City on the Sheikh Zayed Road in Dubai. Fast becoming a favourite among business travellers and tourists visiting the thriving UAE city, the hotel comes complete with 1,010 air-conditioned guestrooms and a host of modern recreation services, with easy access to Dubai’s landmarks and famous beaches. Voted the ‘Best Hotel for City Trips in Dubai’ in 2013 and holder of the Certificate of Excellence from TripAdvisor, the hotel is fast establishing itself as one of the best sources of accommodation in the region. Representatives from the Gloria Hotel host and attend a number of corporate events throughout the year. One such event is the Arabian Travel Market tradeshow, the leading travel event where industry companies showcase what they have to offer to the region’s tourism industry. To highlight the fact that the Gloria Hotel would be exhibiting at the show, the marketing department created a graphic banner that would be placed on all employees’ email signatures. With the sheer volume of emails sent out per day, this was the perfect opportunity to ask recipients to attend the show and visit the the hotel’s stand. Problems soon arose, however, when all staff members were told to add the banner to their signatures. “There were some colleagues who knew how to do this,” explains Dion Mendonca, IT Manager at the Gloria Hotel. “Others would call us asking for help and our IT staff would have to spend hours updating each user’s signature individually.” Inevitably, this took up a great deal of time that would have been better spent on the more technical jobs they were required to perform. The IT helpdesk simply could not allocate such a high level of resources to this one project. Researching products that would allow him to automate this process, Mr Mendonca decided on Exclaimer Signature Manager Exchange Edition in order to manage the distribution of the marketing banner from one central location, the hotel’s Exchange server. The main benefit was that all employees did not need to be informed about any changes being made to their email signatures and the IT department could implement the software solution quickly. This meant no more support calls or visits to a user’s PC. “The team at Exclaimer were very helpful and the software required no special skills to to set up,” said Mr Mendonca as he downloaded his initial software trial. “There was no service disruption and it only took two of us to set up the configuration.” He found that the software was ready to go in less than 30 minutes, allowing for the campaign banner to be added to all signatures without any problems, freeing up the IT helpdesk to move onto other tasks. The positive impact was instant. As well as allowing the IT helpdesk to add the campaign banner centrally through the Exchange server, it also allowed them to add it to outgoing emails only, preventing the banner being attached to every internal email. In the past, this would have unnecessarily increased the size of the hotel’s email inbox, causing a reduction in overall bandwidth. 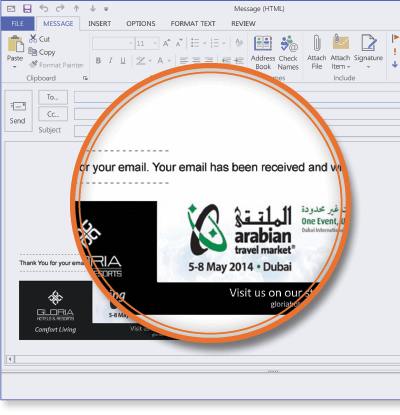 By purchasing Exclaimer Signature Manager Exchange Edition, the Gloria Hotel now has the opportunity to create specific campaign banners from within the Exclaimer software purchased rather than utilizing a separate program. With the number of event banners the hotel produces, the software has already ‘paid’ for itself many times over.